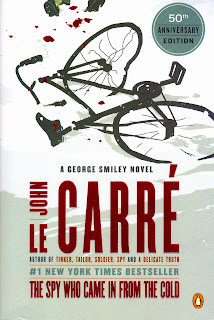 If you haven’t heard already, it was 50 years ago this month that John le Carré’s breakout novel, The Spy Who Came in from the Cold, was released in Great Britain. That was 1963, the same year another, somewhat more flamboyant author familiar with the machinations of British foreign intelligence--Ian Fleming--witnessed the publication of his 10th James Bond novel, On Her Majesty’s Secret Service. While the latter work was something of an adult male fantasy/adventure, filled with brainwashing and gunplay, heroics and a bit of on-the-job romance, the former was a much less optimistic exploration of Cold War spying, in which the protagonist, disgraced Alec Leamas, becomes a pawn in a game being played by more experienced hands. The Spy is set in the early 1960s before the assassination of John F. Kennedy, before the real advent of hippies, the pill, the Vietnam war, the “swinging sixties” and all the familiar counter-cultural baggage that goes with it. Its tone, if anything, is dourly 1950s, its colours grey, its weather depressing. It’s worth remembering that rationing in Britain finally ended in 1954; that the Second World War was a fresh memory (Leamas is a veteran); indeed, that anyone in their 70s would be a survivor of the 1914–18 war, the First World War. The action of the novel takes place half a century ago. It belongs to an entirely different world from the one we know today. And yet, and perhaps this is the first remarkable comment to make about The Spy, its cynicism is resolutely de nos jours. One forgets just how unsparing the book is, how the picture it paints of human motivations, human duplicities, human frailty seems presciently aware of all that we have learned and unlearned in the intervening decades. The world was, on the surface, a more innocent, more straightforward place in the early 1960s: there were good guys and bad guys and they were easy to spot. One of the shock effects of reading The Spy when it was published must have been the near-nihilism of its message. It is unremittingly dark--or almost so--and this fact, I believe, lies at the root of its greatness. In the same way, there’s no telling what will become of this current season’s crop of crime, mystery, and thriller novels. Will any of them still be remembered half a century from now with the same sort of respect that The Spy Who Came in from the Cold enjoys? Possibly, though the odds are against it. Regardless, one must recognize that there are numerous fine entries in this genre due out in bookstores over the next four, chillier months. Frederick Forsyth, Anne Perry, Michael Connelly, Philip Kerr, Sara Paretsky, and George Pelecanos all have fresh fiction winding down the pipeline. As do Max Allan Collins, Theresa Schwegel, Ian Rankin, Jo Nesbø, Val McDermid, David Downing, Ken Bruen, Jeri Westerson, Christopher Fowler, and Wallace Stroby. Even storytelling greats such as Robert Stone and Thomas Pynchon are making contributions to this genre. Then there are a couple of non-fiction works worth looking out for as well: A Mysterious Something in the Light: The Life of Raymond Chandler, by Tom Williams (coming from Chicago Review Press, after an initial release last year in the UK), and Andrew Lycett’s Ian Fleming (which originally appeared on the other side of “the pond” back in 1995, but is finally being brought to the States by St. Martin’s Press). You thought your to-be-read pile couldn’t get any higher? What follows isn’t even close to a comprehensive listing of the crime fiction due out, on both sides of the Atlantic, between now and New Year’s Day, 2014. These are just the works--most than 200 of them!--that I think might be most interesting to the greatest number of Rap Sheet readers, either because of the track records of their authors or the seeming novelty of their plots. If you’d like to see what other titles are being readied for your amusement, check out The Bloodstained Bookshelf and Euro Crime’s future releases page. And of course you will also want to find some free time in which to re-read The Spy Who Came in from the Cold. Or to read it for the first time. Seriously, if 50 years of prominent recommendations aren’t enough to get you to pay attention to this classic spy tale, whatever will it take? Did I miss mentioning any books that you’re particularly looking forward to reading over the coming four months? If so, don’t hesitate to mention them in the Comments section below. READ MORE: “Last Chance: 10 Criminous Yarns to Get You Through 2013,” by J. Kingston Pierce (Kirkus Reviews). The Chandler bio is exciting, and I'm always up for a new Lawrence Block. Frederick Forsyth's latest offering "The Kill List" is an ordinary affair, similar to his previous offering "The Cobra". You won't find the masterful storytelling that was so evident in "The Day of the Jackal", "Avenger", "The Fist of God", "The Odessa File" etc. In other words, Forsyth has lost his touch. The plot is good, but the description too simplistic. His previous masterpieces contained detailed narratives as well as an intricate plot, not to mention a plot twist at the end. None of this was in display in "The Kill List". I am an admirer of Forsyth, but I have decided not to read his forthcoming works (if there would be any). I wish to remember him as the author of "The Day of the Jackal" and not the boring "Cobra" or "The Kill List".